Everyone has heard of the “ice age”—no, not the movie, but the period known as the Pleistocene, when Earth’s temperature dropped and glaciers spread. But have you ever heard of the Eocene epoch? Between 56 and 34 million years ago, Earth was hot. Like hot house hot. North America was covered by tropical forests. That’s right, Texas and California looked like the modern-day Yucatán. A trip to Big Bend National Park would be less desert, more Costa Rica. Sounds pretty lush right? Imagine walking through a now-arid climate and seeing primates that resembled bush babies or lemurs! Well, that’s exactly what you would have seen in San Diego, too, according to Dr. Chris Kirk and Amy Atwater. This story begins with bones. Since the 1930s, researchers have been collecting fossilized primate bones found in the sandstones and claystones of an area known as the Friars Formation in San Diego. Stephen Walsh, a paleontologist (a scientist who studies bones), built an exceptionally large collection, primarily through a process called salvage paleontology, wherein paleontologists clear sites in areas like San Diego that are experiencing rapid suburban and city growth. Walsh and his team found lots of fossilized bones through this process, but it also created some challenges for ongoing research. Returning to areas that are now gas stations and strip malls doesn’t allow for further digging or discovering. The detailed process of describing fossils for a scientific publication takes a lot of time. Walsh and his team could not identify all the species they rapidly acquired before his death in 1997. Dr. Kirk’s primary research is about primates in the Big Bend of Texas, but many years ago, a colleague showed him representative fossils from a San Diego primate, thinking it was possible they were similar species to Big Bend primates. When helping Amy Atwater choose a Master’s topic as a UT graduate student, Dr. Kirk remembered this potential connection. Shortly after, Atwater traveled home for a wedding, which just happened to bring her through San Diego. She discovered drawers and drawers of undescribed mammals at the San Diego Museum of Natural History. Museum staff delighted at the idea of a researcher taking on the project of describing Walsh’s fossils. Atwater carefully loaded up a suitcase with specimens. Back in Texas, Atwater and Kirk got to work identifying species. Along the way, they discovered three new species: Ekwiiyemakius walshi, Gunnelltarsius randalli, and Brontomomys cerutti. The first species was named after Stephen Walsh and the area where it was discovered. Ekwiiyemak means behind the clouds and was the name given by the Native American Kumeyaay to the area where the San Diego and Sweetwater rivers meet. The second species was about the size of a fat-tailed dwarf lemur, and was named for Gregg Gunnell and Kesler Randall. 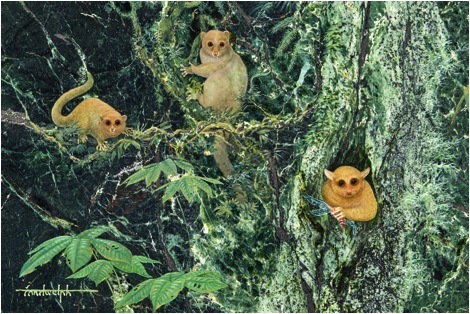 The last species was about the size of a living sportive lemur. It was named for the Greek word for thunder and Richard Cerutti. Atwater and Kirk’s research findings were published in the Journal of Human Evolution alongside a painting of the creatures. Kirk’s father, Randy, helped him visualize the three species. Randy Kirk is an artist who began his career by painting wildlife. His attention to detail and engaged dialogue with his son made these primates come to life. After months of drafts, sketches, and detailed conversations (sample question for discussion: would these primates likely have had a wet or dry nose? ), Kirk’s father painted this image on marble. Paleontologists uncover lost worlds and reveal how primates are a major part of the evolution of our planet. If you want to learn more about salvage paleontology, check out this article from the Washington Post. Amy Atwater is now a Paleontology Collections Manager at the Museum of the Rockies in Bozeman, Montana! Learn more about her work in this PBS special.